MIAMI - Thirteen games in, the Phillies have reached their first little gut check of the new season. It would not be accurate to call it a shake up, but manager Gabe Kapler plans some changes to his lineup for Sunday's game. He will likely give some rest to catcher J.T. Realmuto and go with Andrew Knapp behind the plate. 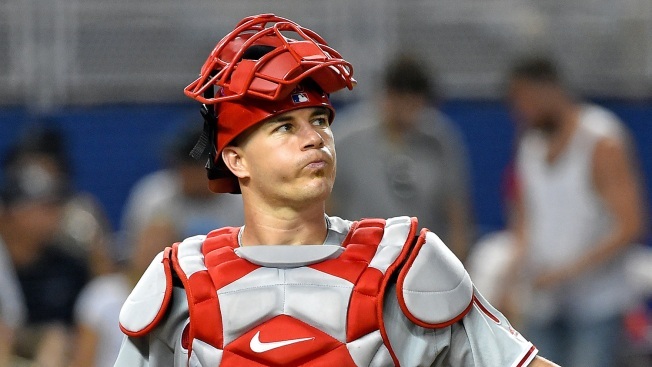 And Scott Kingery is slated to start, possibly at second base in place of slow-starting Cesar Hernandez, possibly somewhere else. "We're going to find a way to get Kingery in the lineup tomorrow," Kapler said. "Not sure where he's going to play, but he's going to play tomorrow." Kingery earned his way into the lineup for the series finale by coming off the bench with a pair of late doubles in Saturday night's loss. Maybe he can provide a spark to an offense that, other than a 14-hit bust-out in Friday night's win over the Marlins, hasn't done a lot lately. The Phils were held to three singles in a 15-1 loss to Washington on Wednesday night. Saturday night, they were shut out on one hit through the first seven innings. They did all their scoring in the ninth inning - garbage time. "We have to do better," Kapler said. "We have to swing the bats better." "I thought we had him on the ropes there," Kapler said. "We were really close to putting their backs up against the wall. He threw 29 pitches that inning and then he just kind of settled in, got in a rhythm and a groove and got a whole lot more efficient and we weren't able to catch up." First-inning scoring has been a problem for the Phils so far. They've had 26 first-inning base runners in the first 13 games and stranded 70 percent of them while scoring just eight times. "I think a couple pitches were (poor) location, but for the most part I honestly thought I had really good stuff tonight," Eflin said. "I felt really good in the first and second inning and after that it seemed like they started jumping on my stuff. Just one of those games where the cards didn't go my way so swallow it, flush it, come back out in five days. "It was a weird game. Things that normally don't get hit were getting hit. Everything was healthy, everything was fine, just one of those weird games." Vince Velasquez gets the ball in a very important series finale Sunday afternoon. Sure, it's only game No. 14 of the marathon and the first bead of sweat hasn't even collected on the Phillies' collective forehead. But teams with designs on winning the NL East can't afford to lose series against the Marlins. In other words: Mini gut-check game.